When I started practicing yoga regularly last year, I found myself drawn to the instructors who began each session by setting an intention for the practice. Whether it was an intention solely for our practice or whether it was an intention that could carry over into the remainder of the day, I loved having an intention to work towards. Some days I would wake and set my own intention outside of my daily yoga practice. But often, I would forget. It wasn't something that was on my daily radar. More often than not, I needed the discipline of yoga in order to set an intention for myself. Most mornings, as soon as my alarm goes off, my feet hit the floor, and I am off and running, almost instantly getting sucked into the the vortex of another busy day. Over the past week as I began to think about the new year and the personal changes I wanted to make, I couldn't help but to think about how those daily intentions help me to focus and keep perspective during the day. It seemed only natural that my word for 2016 should be INTENTION. Not only do I want to set an intention for myself each day, but I also want there to be intention behind the actions I make and take. I want to be more aware of why I am doing something and the end results I want. So often we are operating on auto-pilot, completely unaware of what we are doing and why we are doing it. I want to make a conscious effort to turn off auto-pilot and start to think about what I am doing and why. What do I hope to gain or accomplish? Whether it's something as simple as relaxing with a magazine or something more intensive as a new blog project, I want to set an intention for the action and follow through with it. 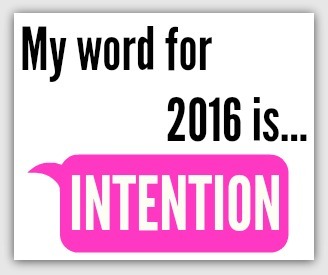 Here's to a thriving 2016 and to intention! Do you have a word for 2016? I'd love to know your word and how you decided on it.